Normally, games that are too easy aren't too much fun (think bumper bowling). 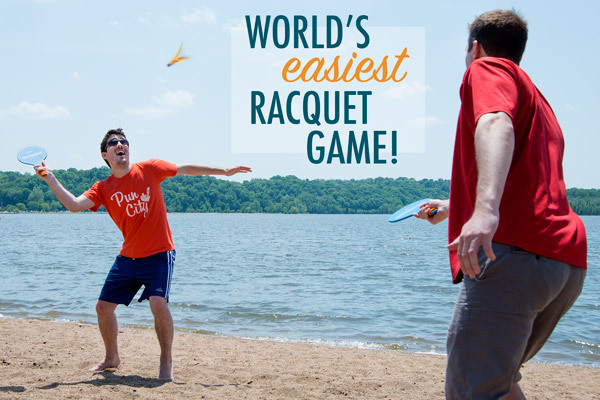 However, Goodminton breaks the mold because it's easy and fun! 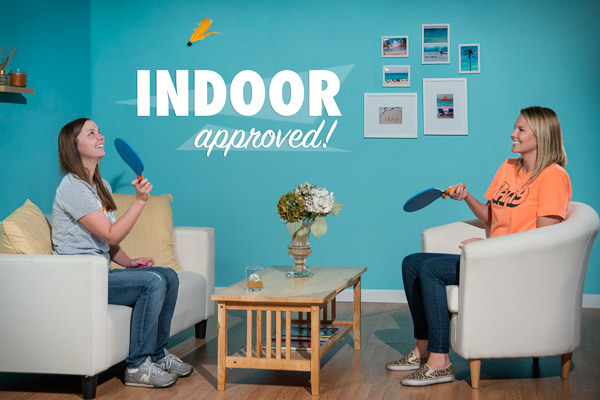 Designed for indoor and outdoor play, Goodminton is the racquet game for everyone. Its specially designed birdies feature angled feathers which make your shots fly straight and at a consistent speed no matter how hard you hit them. 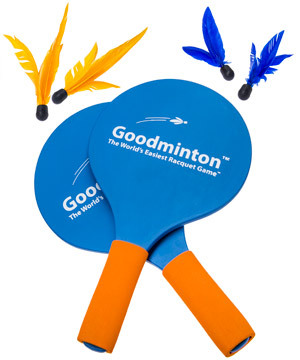 Each set of Goodminton includes two wooden paddles, two fast birdies, and two slow birdies. With Goodminton, you'll be feeling like Roger Federer! The secret to Goodminton's ease-of-use is the specially-designed birdies. The long feathers, angled to ensure a spiraling action, and a sufficiently-weighted rubber tip help to maintain a comfortable speed regardless of how hard they're struck. Their bright color is also easy to spot. After extensive testing, we (along with the evil boss' 5-year-old daughter) can assure you that Goodminton is truly the world's easiest racquet game! Goodminton has zero learning curve. Just pick up the racquets and start playing! Goodminton ships with two different styles of birdies: short feathers and long feathers. The longer feathers slow down the flight of the birdie, making it ideal for younger kids or indoor play. 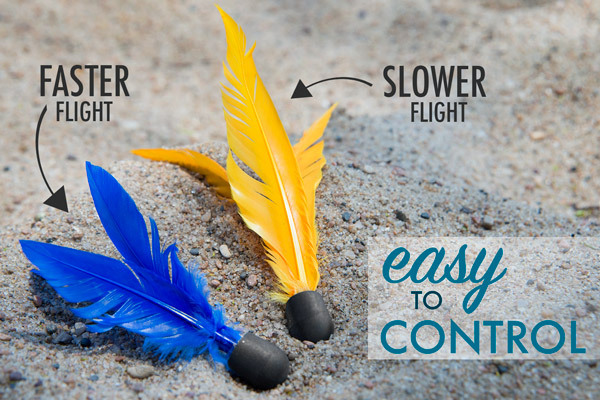 The short feathers allow for faster flight and are great for windier days and more advanced players. 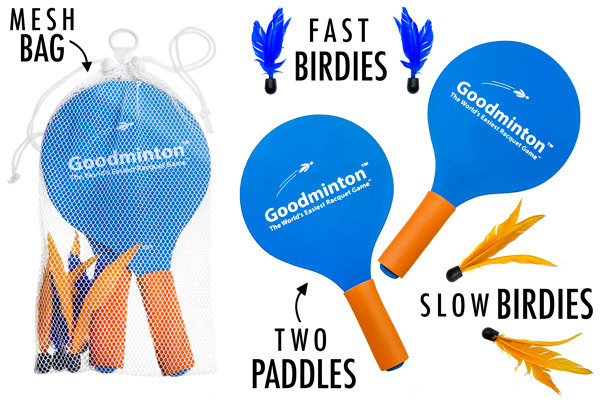 Goodminton comes with two styles of birdies: fast and slow. Goodminton birdies are so incredibly easy to control that you can rally with someone mere feet away. Use the slower birdies for manageable flight indoors. Goodminton includes two paddles, two fast birdies, and two slow birdies. Anywhere you can find another willing human, you can play Goodminton! Goodminton includes two paddles, two fast birdies, and two slow birdies. Question: How is Goodminton less evil than badminton? Answer: Remember, Goodminton is all about ease of play. Badminton, while fun, can be a bit of a bear to setup and play. Badminton requires a net, the head of its racquets are small and the handle is long, and the mostly white birdie can sometimes be hard to see. Goodminton, on the other hand, is super easy to setup and play. No net is required in Goodminton. The racquets have relatively big heads with short handles and the birdies are brightly colored. Plus, their long feathers deliver consistent speeds and straight flights. Lastly, Goodminton calls its birdies "birdies" and not "shuttlecocks". Answer: Where you're going, you don't need nets! Goodminton is all about maintaining a long rally, so the net isn't necessary. However, the Goodminton police aren't going to confiscate your paddles if you decide to increase the difficulty a bit with a net.